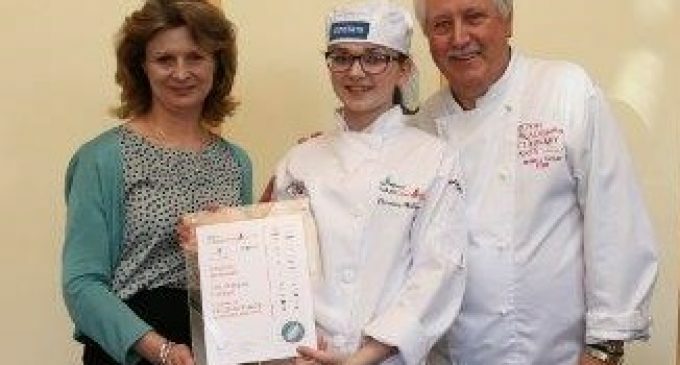 Two young Scottish contestants picked up second and third place at a major cookery competition final held in London. Courtney McDowell (pictured above), from City of Glasgow College, and Connor Duncan (pictured right) , from the Menie Estate Golf Academy, Aberdeenshire, picked up second and third prizes respectively in Springboard’s Futurechef final earlier this month. Bethan Disley-Jones, 14, was crowned overall winner, beating over 8,000 contestants to claim the title for 2016. Courtney, 16, will experience receive work placement in the VIP area at the Delaware North box at Wembley for the Summertime Ball 2016, where she’ll shadow the executive head chef for hospitality, Mark Reynolds. Connor will prepare an inspirational dinner with the Elior development chefs to produce a fine dining banquet for 100 VIP guests. Meanwhile, winner Bethan scooped an experience at Henley Regatta in July, working in the fine dining Fawley Meadows restaurant with Sodexo Prestige executive chefs. She also won a boat trip on the Thames, a day’s racing with accommodation and a year’s student membership of the Craft Guild of Chefs. Her school received £400 of vouchers courtesy of Lockhart Catering Equipment. A nationwide culinary initiative delivered in over 700 schools throughout the UK, FutureChef aims to help young people aged 12-16 to learn about cooking and to better understand the value of nutrition.